Kiev, March 28: The BBC on Thursday said it had agreed to pay damages to Ukrainian President Petro Poroshenko over an article that incorrectly claimed Kiev paid USD 4,00,000 to secure a meeting with US leader Donald Trump. Poroshenko, who is seeking re-election in weekend polls, sued the broadcaster over the report from May last year. The article on the BBC website claimed that Kiev gave Trump's former personal lawyer Michael Cohen a "secret payment of at least USD 400,000" to "fix talks" at the White House in June 2017. 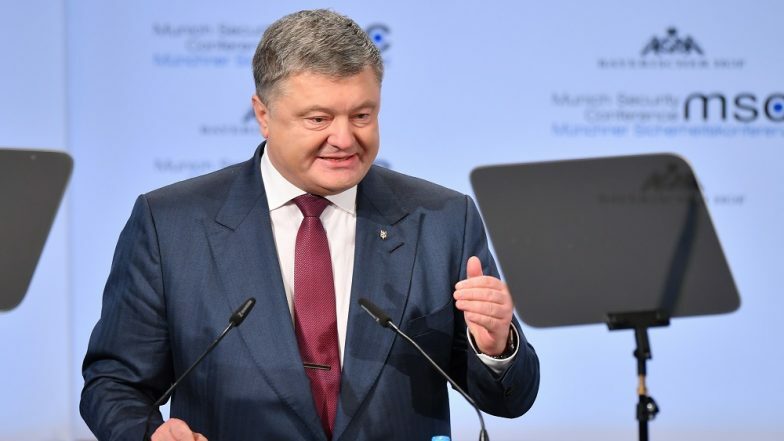 "We apologise to Mr Poroshenko for any distress caused and have agreed to pay him damages, legal costs and have participated in a joint statement in open court," the BBC said in a statement on its news site. Ukraine-Russia War? Petro Poroshenko Warns of the Possibility. It did not give any indication of the size of the payment. Poroshenko had said via lawyers that the article harmed his "political and business" reputation and caused him "substantial distress and embarrassment". Allegations of "serious corruption" were especially damaging because of Poroshenko's "promotion of a number of anti-corruption measures in Ukraine", a claim said. Poroshenko was elected in 2014 after Ukrainians took to the streets to oust his Kremlin-backed, graft-tainted predecessor. But Ukrainian and Western observers have repeatedly questioned pro-Western Poroshenko's resolve to reform the country's kleptocratic system. There was speculation ahead of the June 2017 talks that Trump would refuse to meet the Ukrainian leader. Washington did not announce the sit-down in advance -- as is customary -- and when it was described, the White House called it as a "drop-in" with the US president. Cohen has since been sentenced to three years in prison for election finance fraud, bank fraud, tax avoidance and lying to Congress, after implicating Trump in some of those crimes. Poroshenko is trailing comedian Volodymyr Zelensky in polls as Ukrainians prepare to vote in the first round of a presidential election at the weekend.